Have you ever wondered where all of the spam that finds its way into your inbox comes from? – Who sends you all of those Viagra, Replica Watches, Male enhancement, University Degree, Casino, Stock Market and Weight Loss emails? 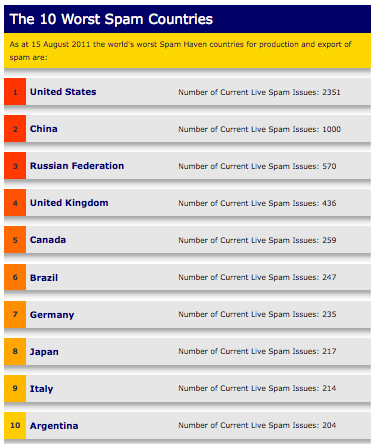 – How much spam is sent each day? 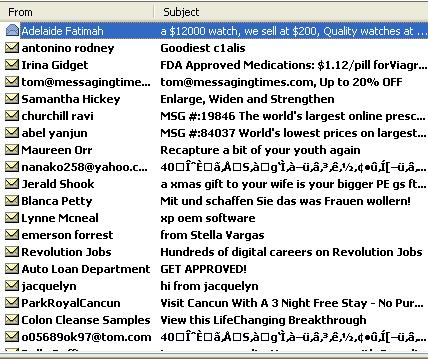 – How much money do spammers make sending all of that junk to us anyway? Surely, not enough people respond to that annoying spam to make it worth their while to keep sending it? Do they? – 80 percent of all spam delivered to North America and Europe is sent by only 100 spam gangs, comprised of about 200-300 individuals around the world. – Spamhaus keeps a list of active spammers (i.e. spammers who were suspended from at least three ISPs.) Visit the Register of Known Spam Operations (ROKSO) database. USA! USA! Oh, wait, this is one of those lists you don’t want to be at the top of. D’OH! What is the average spam conversion rate? A recent study conducted at University of California, Berkley and UC, San Diego calculated that 1 out of every 12,500,000 spam emails will convert into a sale! The average spam conversion rate is less than 0.00001 percent. – Spam email earns spam gang members about $7,000 a day or $3.5 million a year! – Worldwide productivity cost of spam has been estimated to be $50 billion in 2005. How much spam is sent each year? – In 2010, 200 BILLION SPAM EMAILS were sent EVERY DAY! For information about the more practical aspects of spam which affect email marketers and other email senders around the world, read understanding spam, email reputation and recipient behavior. Interested? Use GroupMail opt-in email marketing software to send legitimate email to your customers and subscribers.